Lionel Messi is slowing down. It’s a painful thing to admit, but it’s true. As the old saw goes, Father Time is undefeated, and there is no greater testament to how unbelievable Messi was at his peak than the fact that he remains far and away the best player in the world in spite of Father Time’s efforts to claim what will be one of his most impressive victories. Similarly, there’s no better testament to Messi’s enduring genius and his dogged commitment to his ultimately doomed fight against age itself than the fact that, even if he no longer reigns so supreme when the action on the pitch moves at its fastest, Messi has learned to compensate for some of what he’s lost by mastering the part of the game that happens when things come to a complete stop. Messi’s Barcelona traveled to crosstown rivals Espanyol on Saturday for the Catalan Derby. As he so often is, Messi was spectacular. Of his 10 attempted dribbles, eight were successful. Of his five key passes, two of them were classified as big chances, and one of was the assist on Ousmane Dembélé’s predictably pump-fake-enabled goal. Of his six shots, only one was off target; the keeper saved two of them, one hit the woodwork, and two found the back of the net. Both goals were gorgeous, curling efforts Messi sent in from outside the box on direct free kicks. In some ways, Messi’s game was a throwback to those he was putting up a few years ago, when, as the general leading the terrifying MSN battalion, Messi passed and dribbled and shot and scored and orchestrated and ran and ran and ran his way to becoming the best, most quintessential version of himself that ever existed. Messi is still capable of doing most everything he could do back in his recently departed peak years, and some of it he does even better and more intelligently now than he did then. Really it’s only the running that he’s no longer quite so proficient at. For a step or two Messi’s feet are still as quick as ever, and in cramped spaces in need of just one burst to power him into a little more daylight from which he can plot his path of destruction, Messi remains unstoppable. And the things Messi can do at a canter far outstrip anything most players could do if they could sprint for 90 minutes straight. But the current Messi is no longer the Messi who could tear down half the pitch at full tilt and blow by even the fastest defenders with just a dip of the shoulder and the power of his raw speed, then amble back toward the center circle, then do it all again three or four more times in every single match. This Messi moves both less quickly and less often than the best Messi, which limits the kinds of problems he is able to solve and the methods with which he is able to achieve those solutions. The quintessential Messi was one of infinite possibilities; this Messi is much more constrained. It doesn’t prevent him from being the best, but it does mean he’s no longer his best. Scoring free kicks has become a specialty of latter day Messi’s game, and like all the weapons in this unparalleled great’s arsenal, he is better at them than anyone else. His two goals from direct free kicks this weekend gave him 19 such goals in the past four seasons. 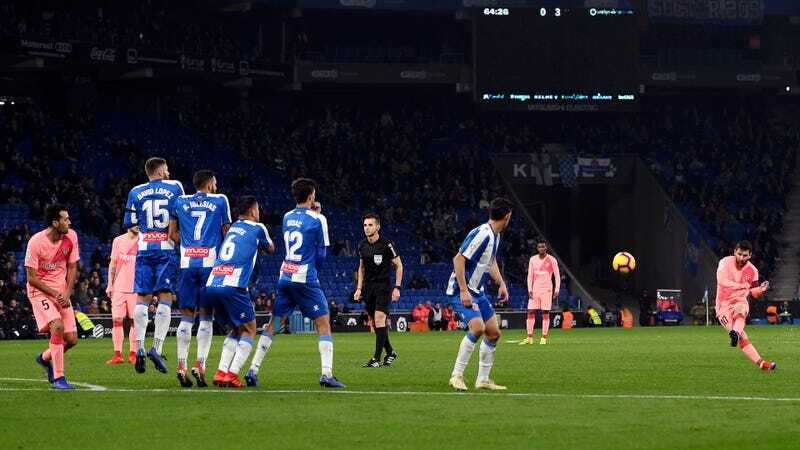 No other team in Europe’s five best leagues has scored as many free kicks as Messi has on his own. The young Messi wasn’t always Barcelona’s designated free kick-taker, and once he earned that designation, he wasn’t always as efficient with them as he could’ve been. Now, though, knowing what glistening opportunities free kicks can be for someone in possession a foot as preposterously accurate as his, and knowing how precious every scoring chance is for a player whose body is slowly but unmistakably losing the zip and spark it once had that let it practically single-handedly create scoring chances at will, Messi treats spot-kick shots the way he presumably treats finishing and passing and dribbling; something to focus the full extent of his talents and work ethic on until executing them to perfection with inhuman consistency begins to look as easy as breathing. A free kick dials up one of the skills soccer requires, isolates it, and freezes the two most important and dynamic aspects of the game—time and space—in a way that crystalize the game’s essence to such an extent that the result almost ceases resembling the sport entirely. A free kick asks a player, in conjunction with only the limited and passive help of his teammates, to stand over an unmoving ball and apply to it just the right amount of force and precision to send it over or under a literal wall of still (or jumping) opponents and into the far edges of the goal. Scoring is the most important part of the sport, and kicking the ball accurately is one of the more important parts of scoring, but never is the art of striking a ball as stark and divorced from the other, even more crucial aspects of open play that lead to goals as during a free kick. Even a penalty, which is less about kicking accuracy than focus and gumption and deception and luck, can’t compare. So it makes sense why Messi would come to appreciate and master the free kick later in life. As your athleticism begins to wane, why not hone the skill that doesn’t require any? As time and space become harder and harder to come by, why not focus on the part of the game where time is infinite and space is fixed? When your body’s limitations no longer permit you to do everything, why not become the best at the thing that only requires a single skill, one you’ll be able to maintain to near perfection long after your body is no longer competent enough at the sport’s other facets to keep you on the pitch? Father Time may be undefeated, but a free kick is timeless. Messi and everyone else stands around the ball, he sizes up his angles and trajectories, and when he is good and ready, he walks up to the ball and kicks it. Get ready, get set, and goal.